Reading Peter Robinson’s series about DCI Alan Banks has me wanting to drink more gin and tonics, eat more pub style food and wanting to visit Yorkshire. This is book # 10 in the DCI Banks series and I am already tucked into the next book. More on that one later. 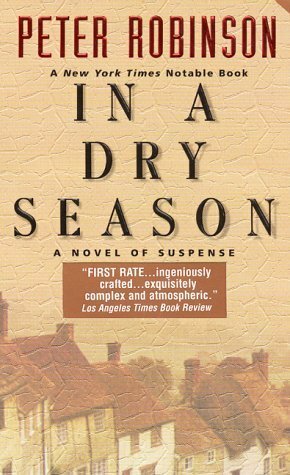 I am absolutely addicted to these police procedurals and will be at a loss when I have caught up with Robinson’s latest books. In a Dry Season starts with skeletal remains being discovered under an old outbuilding. A boy is exploring village structures which had been underwater for over 50 years. The village had been flooded to create a reservoir long ago but with drought conditions, the reservoir dried out, this old town emerges. It’s mostly preserved and as you can imagine, a child would love to snoop around in such a magical looking place. The boy falls through the roof of a structure and discovers the human bones. 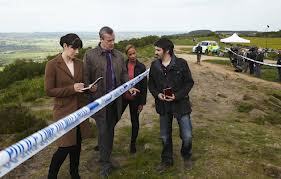 The mystery starts with DCI Banks being assigned to this remote little corner, teaming up with DC Annie Cabot. They have to determine if the remains are from an accident or a covered up murder. How can they possibly know who this was or what happened since the place has been underwater for so many years. The side story features a mystery novelist who is clearly upset when she views the emerging story on television news. Obviously she knows something, you can tell that from the first few pages of her storyline, but how much involvement or information does she have? The story moves back and forth between present day and 1941 in the war era. This book and Final Account have been my favorites so far. I love how Alan Banks’ character continues to develop and hearing about his personal life interjected into the investigation. I am already reading Cold is the Grave, book #11. Totally addicted! Drinks include Swan’s Down Bitter, Theakston’s bitter, claret and Banks’ signature drink, Laphroaig Scotch. Mystery and Police Procedurals – Do you have a favorite author? 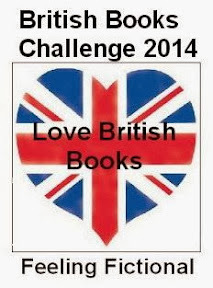 Adding my review to Goodreads, The British Book Challenge, Joy’s British Isles Friday and Beth Fish Reads for her Weekend Cooking Series. 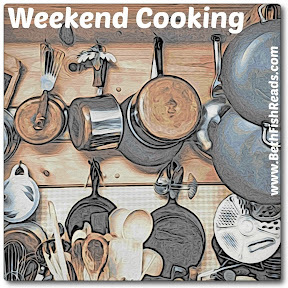 Weekend Cooking is open to anyone who has any kind of food-related post to share: Book (novel, nonfiction) reviews, cookbook reviews, movie reviews, recipes, random thoughts, gadgets, quotations, photographs. If your post is even vaguely foodie, feel free to grab the button and link up anytime over the weekend. You do not have to post on the weekend. Please link to your specific post, not your blog’s home page. For more information, see the welcome post. 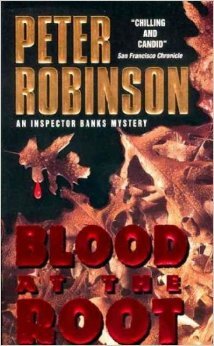 In my opinion Blood at the Root isn’t one of Robinson’s best books with DCI Banks, but that certainly won’t keep me from reading more of this series. There is much going on this book besides the usual murder to solve. Relationships are shattered, there are problems between Banks and his immediate supervisor, his wife wants a separation and he suddenly realizes he is very alone. I felt sorry for Banks in this book. He is stinging from his argument with Sandra and he drops in on his daughter who is a student at Leeds University, only to discover she is out with friends at a pub. When he arrives and sees Tracy laughing and enjoying herself with friends, he hesitates. Not wanting to join her and disrupt the fun he silently leaves without her ever knowing he was there. He is reminded of his wife as Tracy looks so much like Sandra, blonde hair and dark eyebrows. The main storyline is about the murder of a racist, a young man who is/was a member of a neo-Nazi group. There was an argument between him and three Pakistani men so naturally, the Pakistanis fall under suspicion. There are other suspects cropping up once DCI Banks and DC Susan Gay start an investigation. Susan has a private revelation that she is attracted to Alan Banks, a situation that would cause big problems since Alan is her boss. And married. After reading eight books in this series I never tire of Eastvale and how a small town police agency operate, or Banks’ continuing musical journey with opera or jazz or rock and roll. It’s not a foodie book but food is mentioned here and there. The unappealing omelet Banks prepared for himself on late evening, mushroom pizza and one that really grabbed me – Chicken and mushroom pie and an Old Peculiar. Having to stay away from wheat I didn’t make a pie crust but was inspired to make a chicken dinner with brown rice and veggies. It’s not a pub meal but I guess it could be, right? On to my stack of books and will be reviewing The Martian, Skinnytaste and Getting Even. 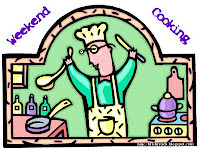 Adding my review to Goodreads and Beth Fish Reads for her Weekend Cooking Series. This is one of the most engaging memoirs I have read in a long time. 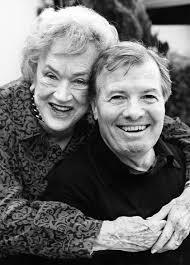 I didn’t know anything about Jacques Pepin’s personal life, his childhood or training in the culinary industry. After reading this book I know so much about him and enjoyed each and every chapter. The funniest story, ok it was a little gross too, was about the calf’s heads. Actually there were many amusing stories in this book so it’s hard to pick just one. Sometimes memoirs can be dry, a bit on the boring side. Not this one. I found myself reading some passages aloud to my husband. As a child he worked in his mother’s restaurants and loved the hectic pace. His younger brother Bichon was the same way while older brother Roland felt it was slavery. 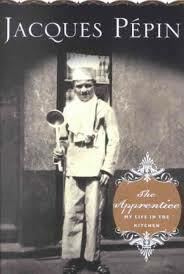 As Jacques moved to an apprentice position in his first real job you learned how the new kid was “initiated” by running a fool’s errand for the chef. He was sent off to a neighboring restaurant to get a heavy kitchen appliance where it had supposedly been loaned. Oh no, they had loaned it to another restaurant and so, off he ran. He was sent on to other places until he secured the item, making his way back across the village with a heavy load strapped to his back. It was just a load of bricks but it showed the drive and initiative of the young apprentice. As he gained more experience he moved to larger restaurants and more responsibility. Learning to cook by observing and making a dish over and over and over was the teaching method. No recipes, no measurements. The most surprising thing to me was he was in on the ground floor of Howard Johnson’s restaurants learning to reproduce good quality food that would be consistent in any of the HJ restaurants. He turned down a chance to work as a white house chef under the Kennedy administration to pursue his initial (American) career at HoJos. The standards were higher back then and you didn’t get sub-quality foods. That changed over the years, particularly after Howard Deering Johnson died. Subsequent owners concerned themselves with cutting costs at the expensive of good dining. Reading about the differences in French and American cultures as seen through young Pepin’s eyes was interesting. Can you imagine being mocked for asking a question in a college class? That was another good chapter where Pepin saw a startling difference between the two nations. Showing up for a dinner and patiently awaiting the bread and wine to arrive, only to realize the American hosts were tucking into their roast beef, potatoes and carrots without a thought of wine. Many more examples are detailed and I don’t want to ruin some of these stories for anyone who has not read the book. You’ll meet Pierre Franey, Craig Claiborne and Julia Child in this book and hear of their good times and business involvements. You’ll learn about hunting wild mushrooms, his military service, working for de Gaulle and his first experiences arriving in America. Recipes follow each chapter so there are many to select and drool over. French cooking doesn’t have to be complicated. Any of the French cookbooks I own call for absolute simplicity and this is what Pepin delivers. Preheat oven to 250 F. Line a cookie sheet with foil. Arrange tomato halves cut side up on the sheet and sprinkle ½ teaspoon of the salt on top. Bake 4 hours. For a shortcut you can heat the oven up to 400 F and put the tomatoes in then turn off the oven. I do this as an overnight method sometimes. Now remove tomatoes from the oven and place in a serving bowl. Let them cool then add mozzarella, capers, remaining salt, pepper, garlic, olive oil and lemon rind. Mix gently to combine. Drop basil leaves into boiling water and cook about 10 seconds. Drain and cool under cold running water. Press basil between your palms to remove most of the water, then chop finely. Add to salad and toss well. Let’s have a toast to Jacques Pepin! I am cross posting to my foodie blog, Squirrel Head Manor. Adding my review to Goodreads, Words and Peace French Book Challenge and Beth Fish Reads for her Weekend Cooking Series. This mystery starts with Rebecca, the vicar’s wife, wandering around a foggy cemetery, hoisting her glass of pinot noir and visiting the angel which sits atop a tomb. As she is having her drunken talk with the angel, she spots the body of a schoolgirl. That would be a horrific surprise if you were sober, never mind in an inebriated state. Rebecca has her own issues with her husband, her home life and an affair with a local teacher. All of those troubles are woven into this mystery and investigation of sixteen-year-old Deborah Harrison’s murder. The day before, Deborah and her friend Megan are walking home in the fog. They part ways near a bridge where Deborah takes a shortcut home through the cemetery. Megan thinks she saw the shadowy figure of a man behind Deborah but the fog was so thick, she can’t be sure. That was the last time Deborah was seen alive. Since Deborah was the daughter of a wealthy and influential man the pressure is on to solve this case as soon as possible. A new detective inspector, Barry Stott, gets a lead early on in this investigation and is hot on the trail of the suspected killer. There are certainly other suspects and factors involved in this homicide and DCI Banks isn’t ready to pin the rap on the first suspect. Banks examines all the other possibilities and factors uncovered during this case. There is a vicar, accused of sexually harassing a refugee worker, who lies about his whereabouts at the time of the murder; Rebecca, his cheating wife and the schoolteacher who is her lover. There is also the accused, Owen Pierce, who has a very spiteful ex and a teen boy who was Deborah’s former boy toy. He previously threatened Deborah’s family and tried to blackmail them. Lots of action in this one and as always, Peter Robinson delivers with an ending you don’t figure out until the last pages. Food wise we have many offerings. What would a DCI Banks story be without that lumbering Sgt Hatchley eating and drinking his way across the Dales? If there were a landlord Hatchley didn’t know by name in all of Eastvale – nay, all of Swainsdale – Stott would have been surprised. Banks and DC Susan Gay meet a potential character witness at an Italian restaurant. After much study and consultation, Banks decided on the gourmet pizza with goat cheese, olives and sun-dried tomatoes and Italian sausage. Susan ordered cannelloni and Michelle ordered linguine with clam sauce. They also had wine. There were also the working pub lunches with Cornish pasties with gravy and chips, Scotch eggs and the usual pints of ale and bitters. Reading these books always makes me want a vacation in England. So many of those goodies I would love to eat, especially sitting down at a pub lunch. Since it’s a British author I thought I would go with a British chef. Nigel Slater’s Pork and Fig dinner was excellent. Next time I would use less fig but more fig jam. The jam was phenomenal on those chops. Recipe may be found at Squirrel Head Manor. Edward Gioachino Giobbi is an American artist and author of quite a few cookbooks. 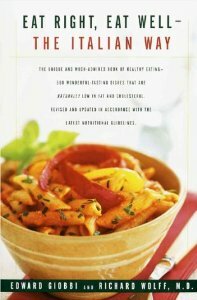 This particular one, Eat Right, Eat Well – The Italian Way was published in 1985. Don’t let the fact that this book is roughly 27 years deter you from trying a few of Giobbi’s recipes. They stand the test of time, as classic recipes always do. This fare presented isn’t heavily sauced or laden with calories. This take on Italian cooking demonstrates the food isn’t always heavy with butter, eggs, creams and high fat items. More of a take on good healthy food which is prepared with the freshest ingredients and lower fat options. The recipes are also presented with personal stories of Mr. Giobbi’s experiences living, traveling and cooking in Italy. 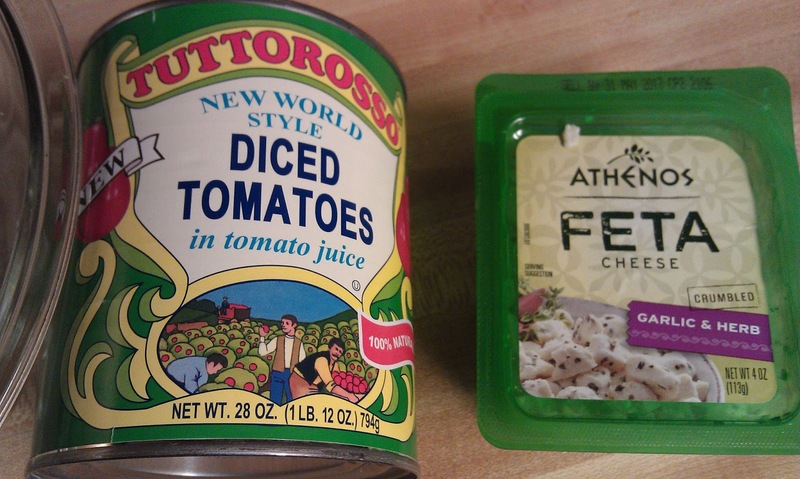 Here is an adaption of Fettucine Alfredo…..substitute Alfeta for the Alfredo. No heavy cream or sauce. The texture is enriched with the feta cheese. Cook fettuccine according to package directions. Drain, return to pan and toss with olive oil. 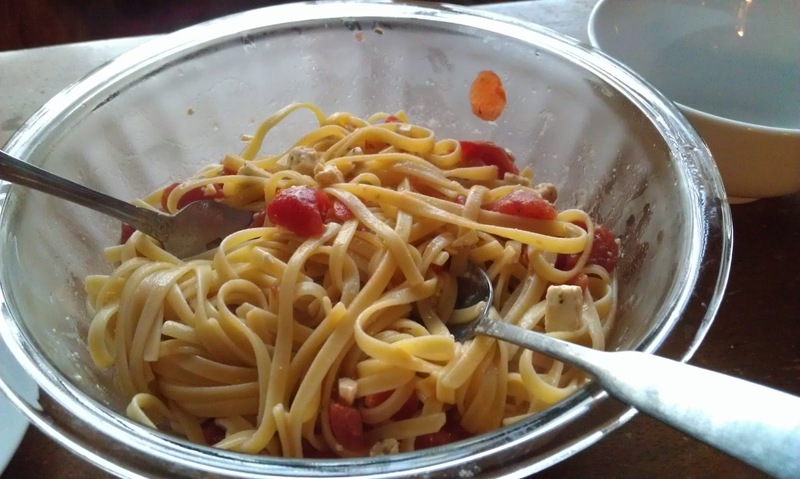 Toss with cheese, tomatoes and basil. Season with salt and pepper. Adding my review to Goodreads and Beth Fish Reads. About two weeks ago I posted about our experience at Gordo’s Cuban restaurant, the mouth-watering food they serve and thus, my desire to crack the neglected Cuban cookbook Clarita’s Cocina. The instructions are very easy to follow and one of the things I love about this book (besides the great recipes) are the stories Clarita shares. Very down-to-earth explanations and suggestions by the author. 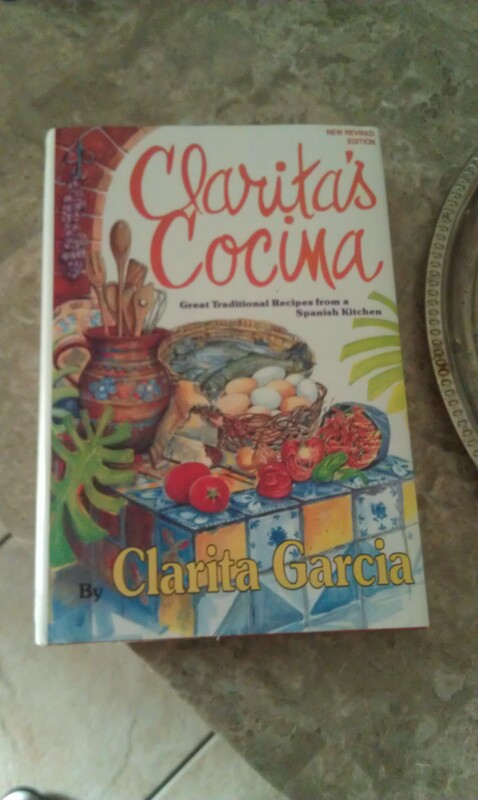 If you are looking for a cookbook with good Cuban cuisine, grab a copy of Clarita’s Cocina. Let me tempt you – included are recipes for Picadillo, Empanadas, Black beans, Seafood Casserole, Crab Meat Croquettes, Ropa Vieja and Arroz con Pollo. Ours is a household where soups and stews are always welcome, no matter the weather. 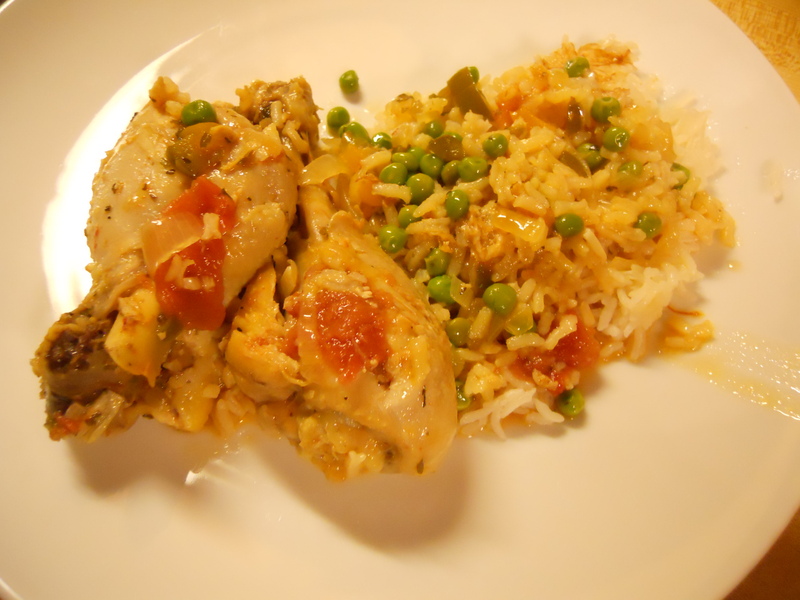 My version of her Pollo Estofado (Spanish Stew) may be found HERE but in this post I must highlight the Arroz con Pollo. The prep isn’t too laborious, it’s just a few steps with lots of ingredients….stirring, simmering, sipping some wine after you have added a cup of white wine into this sumptuous mixture… If you have the desire to peruse a good cookbook specializing in Cuban cuisine, pick up a copy of this book. You won’t be sorry. 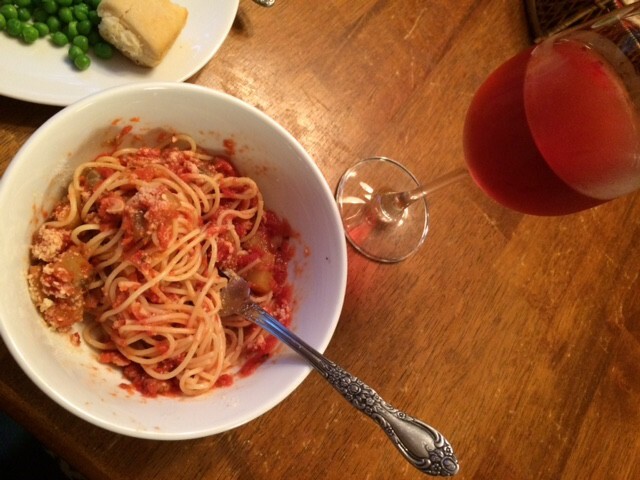 I am linking up to Beth Fish Readsfor her Weekend Cooking series. This a chance to share the food love.